Many people dream of visiting France at least once in their life. In fact France, a country known for its fashion, food and the arts, attracts millions of tourists every year. Whether you stay in the city or rent French holiday villas, there is an abundant of beautiful sites to see. Visit the Eiffel Tower. You just haven’t been to France if you haven’t had your picture taken with the Eiffel Tower. Feel the exhilaration as you ride the elevator up the tower to the highest viewing platform and gaze at the amazing view of Paris. Up for a challenge? Instead of taking the lift down the tower, walk your way down, it’s just a few hundred steps. Don’t forget to buy a souvenir featuring the Eiffel Tower. You can find them in the shop on the second platform. Soak in the arts, visit the Louvre. Be sure to set aside ample time when you come to visit the largest art museum in the world. It is so big that you will literally spend hours trying to navigate the corridors to appreciate the paintings and sculptures made by some of the greatest artists the world has ever seen. Take time to stare at the great artworks like Venus de Milo and Da Vinci’s Mona Lisa; one of the more famous pieces in the world. 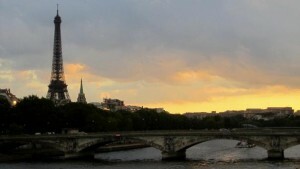 Take a Sunset River Cruise along the Siene. Sail along France’s famous river and be treated to sights of celebrated tourist spots like the Eiffel Tower, Notre Dame, Louvre Museum and the Palais de Chaillot. You can go all out and book a night cruise with dining options. It is a bit more expensive but it will be so romantic it to sail along the Siene River then have dinner at the Eiffel Tower and the Moulin Rouge Cabaret. Walk along Champs Elysees and marvel at the Arc de Triomphe. To visit Napoleon’s famous arc, one will have to walk along the city’s most well-known street, the Champs Elysees. Years ago, walking along the cobblestone steps while hearing the click-clacking of the horse-drawn carriages gave such a dreamy feel; sadly though all these has been replaced with the urban noise of screeching cars and honking horns as people came in droves to the many restaurants that dot the avenue. While you’re there, might as well grab a quick bite too. Remember to bring your camera. A picture with the Arc de Triomphe in the background is another tourist must-have. Take a Double Decker Bus Tour. All first-time tourists to Paris should join these tours. You will be taken around the city, helping you to become more oriented with the basic thoroughfares and local practices. Tickets are affordable but try to book your tour on weekdays to get ahead of the weekend crowd. The tour buses offer 4 different tour routes that you can go through in a day, or you can also opt for a more leisurely pace and divide the tour into two days. Try to secure a seat on an open deck so you can have good view of the city. If you’re planning a trip to France, don’t forget to consider these top things you have to do while in France. Go ahead and soak in the culture, the food and the sceneries. Most important tip of all, have fun!